First of all, I would like to thank theNFF-members Per Jarle Sogn, Bjørn Olsen and Ingvald Hansen, plus Tom Arnheim of The Norwegian Defense Museum. During the work with various scources, it turned out that dates of first flights on the F-104 did vary. We have consequently used the dates given by Jane`s All the World`s Aircraft since they are normally correct. August 7. 1963 was in many ays a milestone in the Norwegian Airforces (KNL) post war history. That day, the American ship USS Croatan entered the harbour in Bodø carrying 13 shining new F-104G Starfighters on its deck. This type represented a giant leap forward, compared with the existing planes in the inventory. The F-104G fighters were all a part of the USAF Military Aid Programme, and were delivered free of charge. Originally the Airforce intended to equip two squadrons with F-104, but it had come to their knowledge that the second squadron could be exchanged into a substantially larger number of the cheaper F-5 Freedomfighter. Such an arrangement suited KNL much better, and their request was granted. Thereby only 331 squadron was equipped with the new fighters. 331 squadron had taken their F-86F Sabres out of service by novembre 1962 and a core of 13 pilots, all officers were kept on hold. They were given a total of 1000 hours in the sabres of 338 squadron untill the Starfighters could be delivered by the summer of 63. By the end of March 1963, 671 hours had been expended. Major Eyvind Schibbye, 331s squadron leader and Captain A. Hove, had undergone combat crew training on F-104 in Amarillo Texas. The remaining pilots then made the transition to the new typein Norway, with good help from the american veteran Captain Joe Nevers. Before the first Starfighters arrived in Norway, a gigantic program was established to produce and equip the airforces of Germany,Netherlands, Belgium, italy and canada with F-104 fighters. Japan was also in it, though the USAF made a very imited use of the type. The key man behind the Starfighter was the legendary Clearence L. "Kelly" Johnson, then the chief of Lockheeds department for development of new designs. He was the man behind the F-80 Shoting Star and would later gain conciderable fame for the SR-71 Blackbird. The Korean war lead to a step-up in the development of a new generation of supersonic fighters in the USA. The comunist states had proven their ingenuity in the air with the Mig-15 and a series of contemporary american types had become outdated. Johnson had been in Korea gathering experience on future requirements for a fighter, and he built a team of his best engineers to start the work. To power the new plane, Johnson chose the General Electric J79, then under development. This engine was set to produce 9.000 lbs of thrust topped to 15.000 lbs on afterburner. Lockheed was not alone in designing new fighter-aircraft. Other types like the North American F-100 Suber Sabre, Convair F-102 Delta Dart and McDonnel F-101 Woodoo were in development. But Johnson was ahead of his competitors and when he arrived at Wright Patterson Air force Base on novembre 5. 1952 he knew that the concept he was to present to the comittee would be something out of the ordinary. In January the next year The decition was made and Lockheed was given the task to develop what was to be called "Weapons system 303A"
The construction of the first XF-104 started in the summer 1953 in Burbank California. The work took only seven months and in february 1954, the companys test pilot Tony LeVier could take off on the first of many testflights. On this stage, the plane was powered by a Wright J65-W-6 without afterburner. Still the Starfighter would reach Mach 0,97 in horizontal flight at 35.000 feet. The XF-104 performed so well that the USAF issued a contract for a series of 17 YF-104 pre-production testplanes. The summer of 1954 a J65-W-7 engine with afterburner was installed in prototype no 1, enableing it to accelerate to Mach 1,49 in horizontal flight, reaching an altitude of 55.000 feet. 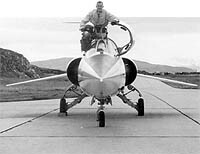 As the F-104 took shape, it also started to break several world records.. May 7.1958 Howard C. Johnson set a new altituderecord at 91.249 feet in aYF-104A. Nine days later kaptain Walter W. Irvin established a speed record of 2.259,85 km/h over a track of 15 x 25 km at Edwards AFB. Other records were the rate of climb, reaching 25.000 m in 4 min. 4,33 secounds. New altitude record was set in December 1959 by an F-104C which became the first aeroplane to take off on its own power to reach 100.000 feett. Record was set at 103.389 feet and was reached in 15 min. 4,92 secounds Theese were increadible numbers at the time, the Starfighter was given wide publicity all over the western world, and Lockheeds designers recieved well deserved honour for their work. General Electric would in addition to the engine, deliver the Starfighters only built in armament, the six-barrel, rotating M61 20mm Vulcan cannon. 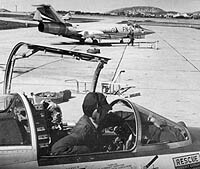 Early tests reveiled problems with vibration and early detonotion of the amunition, but these were countered and the updated version, the M61A1 became standard armament on all later versions of the F-104, exept the two-seaters. The cannons rate of fire was 4.000 pr.min. The first production model of the Starfighter, the F-104A was introduced to USAF service in january 1958. Not as a replacement to the F-100 Supersabre in Tactical Air Command as planned, but as an interceptor at Air Defence Command. This lead to a drastic reduction in the number of planes ordered, from 722 to just 170. The A-model was early phased out from ADC service, but saw valuable use in several squadrons of the Air National Guard. Surplus fighters were delivered to Jordan, Pakistan and Taiwan. Other variants introduced to the USAF were the two-seater F-104B and the tactical fighter-bomber F-104C. The latter delivered in a total of 77 planes to four squadrons in Tactical Air Command from October 1958, finally arriving where it was originally intended. The F-104C also had its two-seater version, the F-104D and 21 were built from novembre 1958 to the squadrons of TAC. The C and D models were phased out of TAC in 1967, to continue service with the Air National Guard.